NEW YORK CITY — A group of protesters is ramping up efforts to thwart the mayoral hopes of City Council Speaker Christine Quinn. 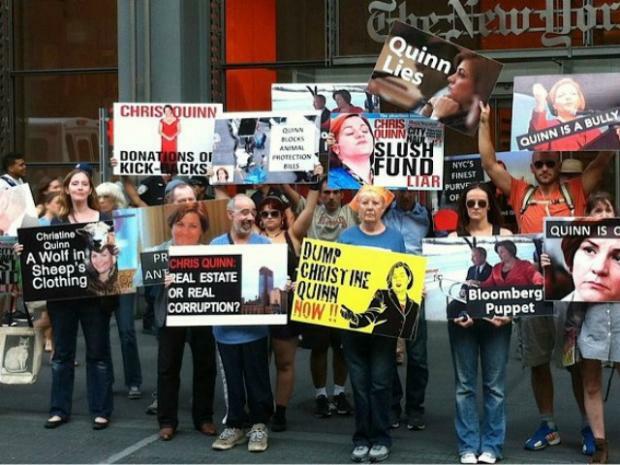 The fringe anti-Quinn contingent has been active for years, protesting outside her events with colorful placards covered in critical slogans. But as the 2013 election to replace Mayor Michael Bloomberg heats up, so, too, has the fervor of those determined to slow front-runner Quinn's ascent — with members planning a full-fledged counter-campaign. “We are going to increase our presence, not only on the streets, but online in social media,” said Donny Moss, 40, a documentary filmmaker who has been leading the Quinn opposition effort since 2009. The group, he said, is planning to swap its small protests for a grassroots offensive, which will include canvassing outside subway stations and across Democratic neighborhoods. "They should be expecting to see us in their neighborhoods and educating them about Christine Quinn's record," said Moss, who said his aim is "to hold her accountable and to vote her out of office." Among the efforts to increase their visibility is a flashy new website, votequinnout.com, which Moss plans to formally launch later this week. The site slams Quinn on multiple fronts, criticizing everything from her role in overturning term limits and paving the way for Bloomberg's third term to concerns over the power she wields as speaker. Moss has also started a new Twitter feed, Defeat Chris Quinn, which has been posting frequent updates, and recently launched a Facebook page under the same name that has garnered more than 800 "likes" since it launched in late October. The group includes familiar activists, as well as other New Yorkers who don't appear to be particularly political active. And others are planning to join the opposition. Allen Roskoff, a prominent gay activist who co-authored the nation's first gay-rights bill, is planning to ramp up his efforts in the new year with the help of his political club, the Jim Owles Liberal Democratic Club, which lists many of Quinn's expected rivals, the Rev. Al Sharpton and Lance Bass on its board of governors. Members, he said, are planning to hit candidates' forums and subway stops to spread their anti-Quinn message. They've also started selling T-shirts emblazoned with images and language criticizing Quinn. "People ain't seen nothing yet," Roskoff told DNAinfo.com New York. “We’re going to be there. We’re going to be loud. We’re going to be seen. We’re not going to disappear." Moss, a staunch animal-rights activist, said his beef with Quinn began after the speaker blocked a bill that would have outlawed horse-drawn carriage rides in the city. “I thought, this is so undemocratic," recalled Moss, whose frustration grew as he watched Quinn help overturn term limits to pave the way for Bloomberg's third term — a move critics say was done in return for the mayor's support for her 2013 run. His scorn grew to encompass her tenure during the so-called "slush-fund scandal," where it was revealed that Council members were handing out discretionary money to fake organizations and political cronies with little oversight. Quinn said she immediately reported the activity to authorities and passed reforms to stop it. Moss' ire also includes Quinn's recent blockage of a mandatory paid sick-leave bill. “As I started to pay more attention to the social justice issues, the human rights issues, the good-government issues, I thought something needs to be done here," Moss said. Both Moss and Roskoff, who have yet to decide who to endorse in the race, acknowledged it is highly unusual to wage an opposition campaign that's not also affiliated with a particular candidate they support. "It's an obscure thing that we are doing, trying to educate voters about why someone shouldn't be elected, instead of why someone should be elected,” said Moss, who added he was concerned that progressive, gay New Yorkers would automatically vote for Quinn without considering the alternatives because they assume she shares their views. "For many New Yorkers, Quinn will be the default vote, simply because she’s gay and a woman," Moss said. “It's our goal to make sure that these voters are looking at her record." Another anti-Quinn advocate, Louis Flores, who began protesting against the speaker ahead of the closing of St. Vincent's Hospital and is in the process of writing an anti-Quinn book, said he feels the momentum growing. He believes the efforts can tap into lingering frustrations over the term-limits extension and other issues, including stop-and-frisk, which Quinn has pushed to reform but not end. He has increased posting on his @stopchrisquinn Twitter feed and said traffic to his blog, Christine Quinn Sold Out, has risen exponentially over the past month. "My blog traffic had just gone through the roof," said Flores, 40, who lives in Queens. "People are definitely tuning in." Quinn's spokesman, Jamie McShane, declined to comment on the opposition efforts, saying he didn't want to engage with the protesters. But former state Sen. Tom Duane, the state’s first openly gay senator and a close friend of Quinn’s, dismissed the organizers as “an inconsequential little group of angry, malcontented people” whom he predicted would never attract a larger following.